Edmund Crispin was the pseudonym of Robert Bruce Montgomery, 1921—1978, an English crime writer, science-fiction anthologist and composer. Writing as Edmund Crispin he is known for his detective novels and short stories featuring Oxford professor, Gervase Fen. Writing as Bruce Montgomery, he was a prolific composer of vocal and film music. (ger)Edmund Crispin war das Pseudonym von Robert Bruce Montgomery, 1921—1978, einem englischen Krimiautor, Science-fiction-Herausgeber und Komponisten. Writing as Edmund Crispin he is known for his detective novels and short stories featuring Oxford professor, Gervase Fen. Writing as Bruce Montgomery, he was a prolific composer of vocal and film music. Edmund Crispin was the pseudonym of Robert Bruce Montgomery, 1921—1978, an English crime writer, science-fiction anthologist and composer. 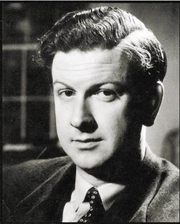 Writing as Edmund Crispin he is known for his detective novels and short stories featuring Oxford professor, Gervase Fen. Writing as Bruce Montgomery, he was a prolific composer of vocal and film music. Edmund Crispin is currently considered a "single author." If one or more works are by a distinct, homonymous authors, go ahead and split the author. Edmund Crispin is composed of 15 names. You can examine and separate out names.